Has the Sierra Kills shooter been identified? The shooter who supposedly shot and killed 2 Bigfoots in the Sierra Nevada in October 2010 may have been identified. On a Cryptomundo thread here, a commenter with the handle “Nominay,” who also comments on this forum, suggests that the shooter is a man named Justin Smeja. Smeja is a 25 year old Californian, an avid hunter, who lives in Sacramento, California. That would place him in close proximity to the location of the Sierra Kills in Plumas County not far away. Here is a photo of Smeja with a mule deer her shot. He is only 16 years old in that picture. Smeja is also a member of the Olympic Project. This ties in with what my source “Bear Hunter” told me. He said that the shooter got deeply involved with the Olympic Project after the shooting. Nominay says that a friend who was close to the shooting incident confirmed that Smeja is the shooter. It’s not yet been confirmed that Smeja is the shooter, and I’m not going to reveal the shooter’s name, although I know what it is. On the Cryptomundo thread, there were some arguments back and forth about whether or not Smeja could be the shooter. Photos of Ketchum study evidence revealed. Here are some photos of some of the evidence that is being used in Dr. Melba Ketchum’s DNA project. 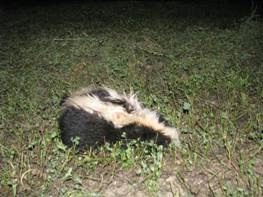 This sample is from the skunk kill reported by JC Johnson from the Four Corners area. A Bigfoot reportedly trapped a skunk in an irrigation pipe and killed it. 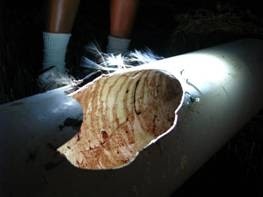 The Bigfoot was apparently injured by the broken pipe. Apparently there was some blood evidence from this incident that was submitted as Bigfoot blood. The only information I have on this was that some of the evidence was tested for nuclear DNA (only a single gene), but not mitochondrial DNA, although the full sequence may have been done later on. The sample was submitted by JC Johnson. I found these photos on the Internet. Blood, surely skunk blood but possibly Bigfoot blood too, from the interior of the pipe. Bigfoot DNA samples in Kentucky were obtained with broken glass. Bigfoot DNA samples were obtained from the site in northern Kentucky where the Erickson Project’s knockout videos were produced. The people at the site were feeding the Bigfoots every night by leaving food out for them. The EP Superglued broken glass to the table where the food was laid out for the Bigfoots. When the Bigfoots came that night to eat the food, the tips of their fingers were cut by the broken glass. In this way, a lot of excellent Bigfoot blood was obtained from the site. Ketchum and Adrian Erickson back on speaking terms. Ketchum and Erickson are back in regular phone contact; however, the contacts have been described as “jockeying for position” on Ketchum’s part. Ketchum burned her best friend for the money and glory. After Ketchum got herself a Hollywood lawyer and wrote up new NDA’s giving herself almost 100% of the proceeds from the study and everyone else close to zero, a number of people left the study because they refused to sign the new NDA. An excellent female geneticist was on the team, and she was close to Ketchum. She refused to sign the new NDA, and Ketchum coldly dumped her from the team. This woman was distraught and absolutely devastated that her close friend would betray her like that for cash and fame. Speculation about Ketchum’s competence is misguided. Although some of my sources have a low opinion of Ketchum as a scientist, I do not share that opinion. I think she’s a good scientist. However, in at least one sense, the criticism is misguided. For instance, on the James Randi forums, they are saying that Ketchum is not competent to do the DNA study because she doesn’t know what she is doing when it comes to DNA. But in a way, it doesn’t matter, because she is not even doing a lot of the work herself. She is sending the work out blind to different labs and having them do the work. For instance, she will send the work out blind to Lab A, they will do the work and send it back to her. Then she will send it out to Lab B in the same fashion to check the work of Lab A and see if they can back it up. In all cases, the samples testing positive as Bigfoot DNA are being done by labs other than Ketchum’s, and their work is being backed up by other labs. In all cases, the labs have agreed with each other on what is what is not Bigfoot DNA. So the samples really are being tested blind by multiple parties, and everything is testing out perfectly so far. This adds excellent weight to the science of her study. Relationship between Erickson Project and Ketchum DNA project hard to describe. First of all, I would like to point out that the EP and the KP are two completely different entities, legally and in de facto reality. However, they have tight ties, which often causes people to confuse the two. The EP is a minimal entity, probably for legal reasons. When you refer to the EP, you can only be talking about three whole human beings – despite the fact that a large number of other folks are associated with the project, you cannot refer to them as part of the project, probably for legal reasons. Nevertheless, the two projects have deep ties. First of all, the EP are the people who enlisted Ketchum to do the DNA testing. This is not stated on the EP website, but this is what happened. She was not their first choice. They went to many others first, but all of those labs turned them down because they did not want to deal with the Bigfoot question. They went to her because she was the only one who would do Bigfoot DNA. Also, the DNA results must be released in tandem with the EP video results. If Ketchum goes ahead and releases her study first, she can be sued by Erickson. So these two studies have a lot more in common than most think. Lindsay confirmed at his blog yesterday that it is Smeja. However, I can't imagine anyone being "surprised" if a man did the same thing. Because this kind of cutting out and stabbing in the back is what the whole Bigfoot research world is about! The prize! The proof! Who gives a crap...if the ends justify the means? REight? It is the reason responsible researchers stay away....this stuff, reads bad on all levels. Hopefully, after all this greed and ego (no one is exempt on that one...)we can move on to things that really matter. Proof may be the worst thing to happen. There would be people trying to make them extinct thinking they're a threat.